Android continues to lead US smartphone market share, and the gap is growing according to the latest figures from Nielsen. For the third quarter of 2011 Android’s share reached 43 percent, up from 39 percent, compared to Apple’s 28 percent, which saw no change. 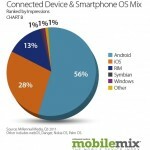 Android saw its gains at the expense of RIM and Microsoft, whose dropping share combined for 25 percent of the smartphone market. Symbian and webOS featured such a small showing that Nielsen dumped them into the “other” category with 4 perent total share. Nielsen reports 43 percent of all mobile phone users own a smartphone, with Apple ranking as the top vendor despite conflicting reports from other analytics firms. The BlackBerry PlayBook has been seen as a disappointment ever since its debut back in the days and even now when it’s priced at the very low $300, it’s still not selling. The thing is that RIM has been hit by a lot of problems recently, including a bad outage that resulted in a class action lawsuit in the US and now the BlackBerry PlayBook OS 2.0 is delayed… Thus, only a hot offer can save the device. Back in September it was revealed that RIM was struggling with sales of its PlayBook tablet, with just 200,000 shipped to shops in the previous quarter, and now the Canadian phone giant has taken action - by offering free PlayBooks in the US and Canada. The buy two get one free deal has gone live over on the North American BlackBerry websites and will, of course, be aimed at businesses rather than people looking to build room made out of PlayBooks. Over here in Blighty, there's no sign of the BTGOF deal yet - but you can nab a free PlayBook through the Carphone Warehouse. If you sign up for a ?30 a month deal for a Blackberry Curve 8520 you'll get a free 16GB RIM Playbook, worth ?239, along with 100 minutes, 1000 texts and 1GB of data for your new smartphone. Not exactly desperate measures but when you consider the PlayBook was touted as an iPad killer, not exactly the kind of form that its makers would have hoped for. Earlier this month Alec Saunders, VP of developer relations and ecosystem development at Research In Motion, told Pocket-lint: "The number one reason the PlayBook hasn't sold as well as we expected is the lack of a native email client, the number two reason is there aren't enough apps." RIM promised to put the latter issue right with the Android player in PlayBook OS 2.0 which was due to launch in 2011. However, earlier this week the company stated that PlayBook customers waiting for its 2.0 OS update will have to wait a little longer, as it will now launch in February 2012. Not only that but the much sought-after BBM service for the PlayBook tablet has now been deferred, "to a subsequent BlackBerry PlayBook OS release". While Millennial is far from the end all be all in OS market share, it’s always interesting to see how Android web usage grows over time and how its numbers stack up to more elaborate figures. They found that Android is now doubling iOS in impressions with 56% to 28%. It’s in line with reports from major analytics firms, having Android steadily outpacing iOS along with other competition. 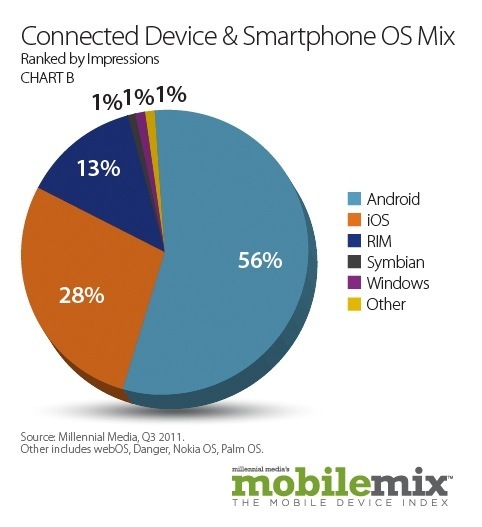 RIM was third with 17% and, as expected, Microsoft and Symbian both had 1% each. We’re kind of disappointed they weren’t wrapped up into the “other” category. As for devices, Millennial is a bit misleading here. They have the “Apple iPhone” leading the pack with roughly 12%, though they’re likely encompassing all iPhone devices into one. We suspect they did the same for the Optimus series and the Motorola DROID series. BlackBerry developers make more money according to Research In Motion, the company that makes BlackBerry smartphones and the PlayBook tablet.? "If you put it on our platform, you'll make more money," execs were keen to tell delegates to the company’s developer conference in San Francisco on Tuesday. RIM says average BlackBerry apps are downloaded 43 per cent more often than an iOS app on Apple and 48 per cent more than the same app on Google's Android platform. “13 per cent developers have made over $100,000 compared to 1 per cent of developers on the Apple App Store that have made more than $1000,” Alec Saunders, VP of Developer Relations at RIM told the crowd before adding that?BlackBerry App World is the second most profitable app store behind Apple’s App Store. ? To put that in perspective BlackBerry 7 smartphones, according to RIM, generate 11x more money when looking at the average revenue per user over BB6 and BB5. Research In Motion has announced BBX at Devcon in San Francisco on Tuesday as it looks to merge its phone and tablet operating systems together. The new platform promises a single unified platform for the company’s smartphones, tablets, embed devices in cars, as well as enterprise, and cloud services. “We will support all open source platforms on the operating system,” explained Dan Dodge the man behind QNX at Research In Motion. The hope is that developers will be drawn to the open platform plugging a gap that RIM has struggled with to date. Part of that shift to appeasing developers is to really embrace HTML 5 for apps rather than insisting developer build for a specific language.? "We are really getting behind HTML5," said George Staikos, the man behind the company's browser technology at Research in Motion.? The BBX platform will include BBX-OS, and will support BlackBerry cloud services and development environments for both HTML5 and native developers. BBX will also support applications developed using any of the tools available today for the BlackBerry PlayBook – including Native SDK, Adobe AIR/Flash and WebWorks/HTML5, as well as the BlackBerry Runtime for Android Apps – on future BBX-based tablets and smartphones. BBX will also include the new BlackBerry Cascades UI Framework for advanced graphics (shown for the first time today), and bring “Super App” capabilities to enable many advanced capabilities including deep integration between apps, always-on Push services, the BBM Social Platform, and much more. 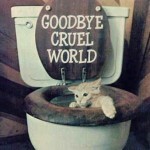 RIM has said that contray to popular belief the company’s subscriber base is still growing at an incredible rate. BlackBerry has rattled off a number of stats to let everyone know that it isn’t doing as badly as you might think. According to the company’s CEO the company now has 50m BlackBerry subscribers, a 40 per cent increase on the figures from last year and has seen a 80 per cent increase in BBM users up to 50m from 28m last year. 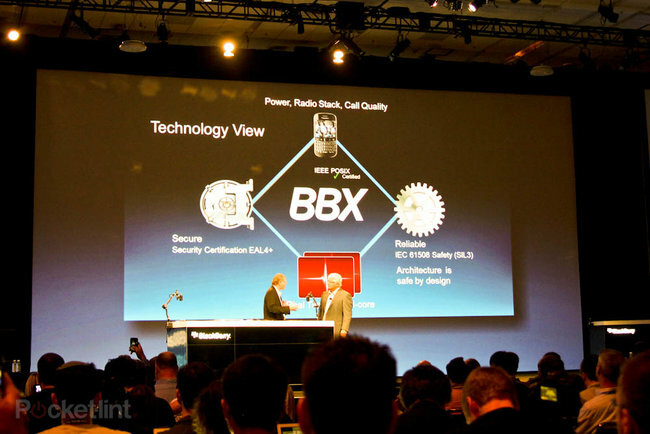 The BB stands for BlackBerry, while the Q will stand for QNX. 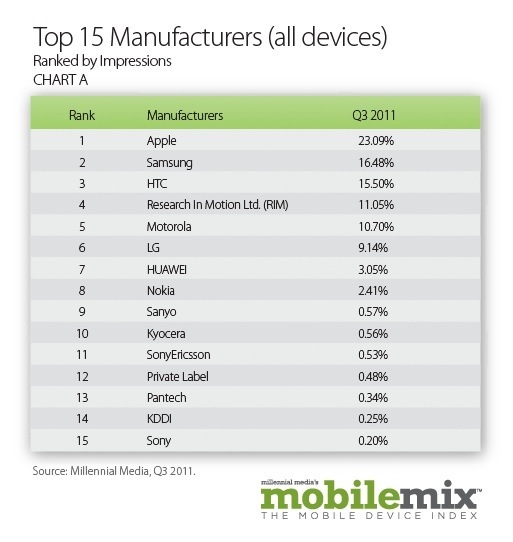 Research In Motion has said that new smartphones with BBX will be here in 2012. What we do know however is that it will look like the PlayBook user interface. ?